LCollective performance with Teodora Stepancic, Assaf Gidron, Matt Lau, Evelyn Emile, Eugene Kim, YoungEun Kim, Douglas Farrand. Soundscapes and University of Orange's Music City project present: Minivan, Khari Johnson Ricks, Minty IV. playing trumpet and piano-8-hands in ensemble works: Alison Isadora: Part 6, Eva-Maria Houben: Echo Fantasy IV, Lucie Vítková: Small Form Pieces, Maya Verlaak: Song&Dance. performed by Danielle Mink-Bellizzi. Denera James. Rahul Nair. Douglas Farrand. Rachel Mangold. Jesse Greenberg. Christopher Foss. Matt Lau. Assaf Gidron. Teodora Stepancic. Soundscapes and University of Orange's Music City project present: MDOU MOCTAR, Tuareg Rock Band from Agadez, Niger and ILL NOMADS from Orange NJ in concert at the HUUB, 47 Cleveland Street, Orange NJ. Doors 7:30PM, Music starts 8:00PM, $5-10 donation Mdou Moctar will also be leading a FREE interactive Tuareg guitar workshop at 4pm. Space is VERY limited to please RSVP by emailing music.city.orange.nj@gmail.com. Bring an acoustic guitar or electric guitar with your own cables (including extension cord) and a small amp. Ofir Klemperer plays music from his MS-20 album. Ofir, Assaf Gidron, Teodora Stepancic, Douglas Farrand, Matt Lau, Jesse Greenberg, and Lucie Vitkova play new septet by Douglas Farrand. Sequence presents: Discrete Species performed by Christian Smith, one hour of music for single percussion instruments (frame drum, spring drum, tile, stone, and saw blades). Two pieces by Esaias Järnegard, Kuarup A+B, open the concert. "Kuarup" refers to a birth or death ceremony, and Järnegard draws heavily from his interest in the Noaidis of Greenland. The third piece, Discrete Species, is a modular work that has been developed by Douglas Farrand and Christian since 2011. This is a 30-minute version for video and pre-recorded material along with live elements like rubbed stone and tile. Assaf Gidron bassoon solo, Gabriela Areal holsa, Evelyn Emile duets, Assaf Gidron clarinet and recorder, Mark So spirit wall and impulse of morning - played by Assaf, Christopher Foss, Denera James, Douglas Farrand, Jesse Greenberg, and Teodora Stepancic. University of Orange’s Music City Project presents a third annual concert featuring church choirs and school choirs from Orange NJ. Playing on a portrait concert featuring works by Teodora Stepancic, organized by Morgan Evans-Weiler. Concert featuring Music City organizers Ray Sykes, Margaux Simmons, and Douglas Farrand. Jeff Weston and I are touring with music for trumpet, bass, and chord organ. 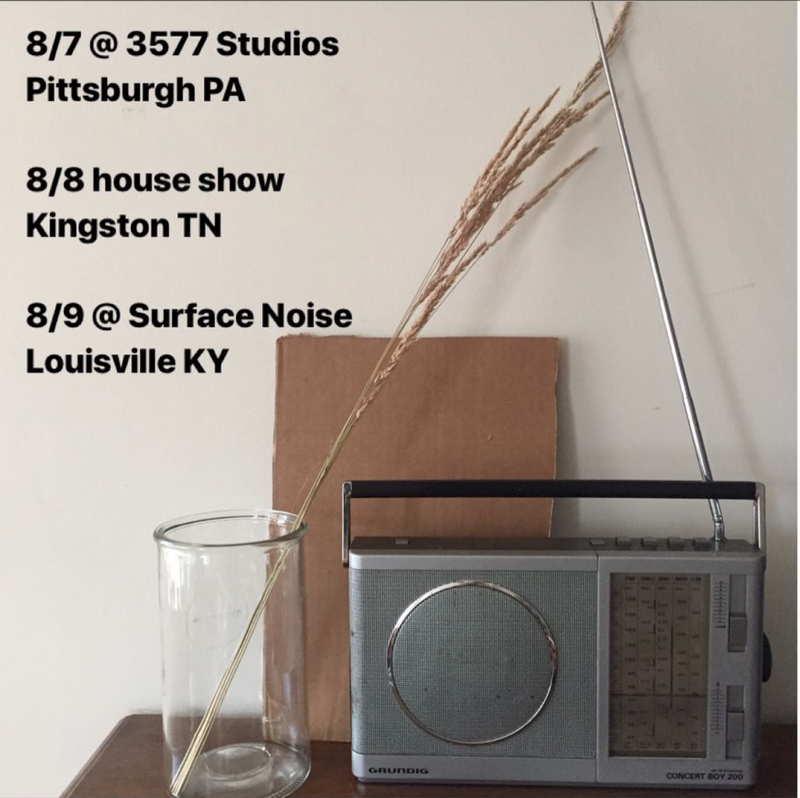 Pittsburgh PA show also features Pittsburgh-based poet Heather Kresge and singer-songwriter duo Paul Lombardo and Juliana Carr from Orange NJ. Piano+ is a monthly concert series curated by composer and pianist Teodora Stepančić. Newly written and recent works together with 20th century favorites. For piano, electronics, various instruments, voices and sound objects. Jan Term is an annual UofO program geared toward the practice of urbanism and strengthening our tools to build healthy, equitable, and beautiful cities. This year's Jan Term, led by the UofO Music Department, is centered around the themes of deep listening, oral history, and storytelling practices. Together we’ll explore the sounds of our city, practice ways of listening to place, to community, and to personhood, and introduce you to our new initiative – “Music City” – which celebrates the incredible diversity of music-making communities in Orange NJ. University of Orange’s music department invites you to join us for Jan Term 2018. To earn your 2018 Jan Term Urbanism Certificate, participate in our seminar, field trip, and a volunteer opportunity. For more information follow University of Orange on facebook or email us at music.city.orange.nj@gmail.com. works by Assaf Gidron, Cindy Giron, Ana Gnjatovic, Sam Sfirri, Douglas Farrand (geese & chords), and Sohrab Motabar. FACEBOOK EVENT. Split Rock Sweetwater Prayer Camp was formed by the Ramapough Lenape nation to educate the public on the impending crisis of the AIM and Pilgrim pipeline that threaten the water supply in our region. Join us to hear from water protectors and to listen to the sounds of this sacred site. Ordinary Affects plays music by Patrick Farmer and Douglas Farrand (August 2017). FB EVENT PAGE. "400 Years of Inequality: What Does America Mean to Me?" Craig Shepard leads day-long intensive workshop including vocal meditations, listening exercises, and group composition. More information here. “six hours” is an extended duration work for cassette tapes, stones, objects, and whistling. The piece is an ongoing accretion of materials and detritus, born out of a daily practice of listening and composition. This is the third performance of the piece. Additional performance include Buffalo (November 2016) and Pittsburgh (March 2017). “six hours” is an extended duration work for cassette tapes, stones, objects, and whistling. The piece is an ongoing accretion of materials and detritus, born out of a daily practice of listening and composition. This is the second performance of the piece. Additional performance include Buffalo (November 2016) and Cleveland (March 2017). On Thursday, December 1st, 1955, Rosa Parks refused to give up her seat on a Montgomery bus and set off the famous Montgomery Bus boycott. This year, on Thursday, December 1st, Orange choirs and choruses will join to sing for peace in the city. Join us at 6 PM, Rosa Parks Community School, 369 Main Street, Orange, NJ. The concert for peace is the inaugural Music City event. Music City aims to bring together and celebrate Orange’s incredible diversity of musical communities. It is a project of the University of Orange's music department with support from Healthy Orange Coalition. from 6pm until midnight I'll be performing a new 6-hour work at the invitation of Rust Belt Books and Kristi Meal, woven from 5 nocturnes for cassette tapes and several pieces for stones, whistling, and sinetones. New works for keyboards written by Jason Brogan, Douglas Farrand, Assaf Gidron, Jeremos Kamphuis, and Sam Sfirri. Performed by the composers with Teodora Stepancic. I’ll play a recent piano piece, ‘piano piece - 75 chords’. This piece will last about 30-45 minutes, and consists of four repetitions of 75 chords. The musical material is a fabric woven from chords derived from the names of many people who have inspired and influenced me this past year, all living and working in Orange NJ. The form is one i rely on a lot, a simple sequence, one thing following another thing. Christian Smith presents recent work, including solo improvisations, sections from my 'discrete species - late winter - solo percussion', and duo improvisations with Louis Freres. 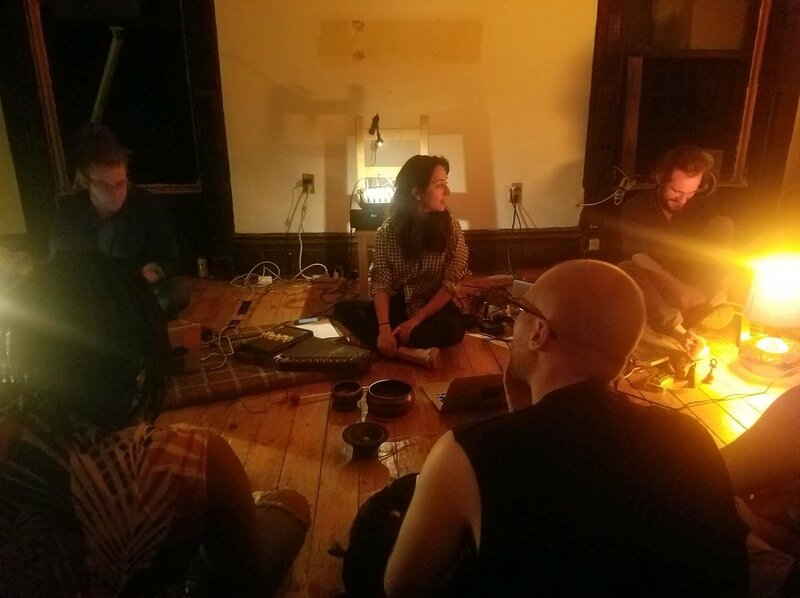 including my new piece "some chords"
"HCL is poised and pleased to host an evening of sound and installation curated by Ryan Packard of Fonema Consort (Sponsored Artists, Fall 2014.) Packard will share his own compositions as well as that of Jessie Downs and Douglas Farrand, composers currently based in Buffalo, NY. The installation showing will take place from 4 to 7 PM, and the concert will begin at 8 PM. Composers Jessie Downs, Doug Farrand, and Ryan Packard will present works that focus on the subtleties of duration, silence, frequency, and timbre, exposing detailed beauty in every grain of sound." Open studio at ORNG Ink.